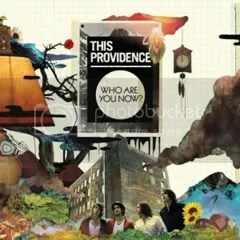 THIS PROVIDENCE – Who Are You Now? Who Are You Now? is This Providence’s third full-length album. This Providence are a four-piece band out of Seattle, Washington, and this is their second album to be released by Fueled By Ramen records. I was initially interested in checking out this album after hearing the fifth track on the album, “Keeping On Without You”. That song reminded me of the songs on Sloan’s Pretty Together, an album I hold near and dear to my heart. “Keeping On Without You” features melodic guitar with a peaceful male vocal and is one of those songs that you like immediately. While it’s my favorite song on the album, there are a number of other good ones on here as well (“Squeaking Wheels and White Light,” “Letdown,” and “That Girl’s A Trick” are just a few I especially liked). The overall sound of This Providence could be described simply as power pop-rock. At times, the vocalist reminds me of what Jonathan Visger of Mason Proper would sound like if he fronted a pop-punk band (It’s a strange comparison, I know). The songs are polished, catchy, and filled with hooks and anthemic choruses that will get you dancing and singing along right away. If you are a fan of any music in this genre, This Providence’s newest will be a fine addition to your collection. This Providence will be embarking on an extensive United States tour from March 25 through May 1, 2010; dates and venues may be viewed on their websites. This entry was posted on March 13, 2010 at 12:00 pm and filed under TheSlacker. You can follow any responses to this entry through the RSS feed.